Arif qualified from St Andrews University and Manchester Medical School. Following a period of time in clinical jobs he entered public health training in the North West of England in 1999. 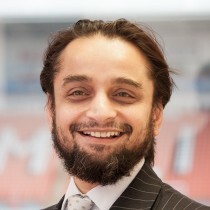 Arif gained his first Consultant in Public Health post in September of 2004, based at Chorley and South Ribble Primary Care Trust. Since August of 2007 Arif has held the position of Director of Public Health of NHS Blackpool and latterly Blackpool Council. Arif, as the joint appointment across Public Health England and the Council, is responsible for improving the health and reducing health inequalities in an area which has the worst male and the third worst female life expectancy in the country. Arif is the lead Director of Public Health for alcohol in the North West and has been heavily involved in national lobbying around alcohol policy and particularly minimum unit price. More recently he has been working with North W Directors of Public Health to lobby for a sugar sweetened beverage tax and to curb the marketing influence of unhealthy food companies on children and young people. He is also currently leading a new approach to tackling obesity issues within Blackpool, particularly focussing on the obesogenic environment and helping to make the healthier choice the easier choice. Arif is also a trainer for trainees in Public Health and has recently been a Part A examiner for the Membership of the Faculty of Public Health. He has an MBA from Manchester Business School and has recently completed a Postgraduate Certificate in Executive and Business Coaching at Leeds Metropolitan University.